Pokemon the First Movie: Mewtwo Strikes back was as the title suggests was the Pokémon franchises debut on the big screen, airing first of all in Japan and then having a staggered release across the rest of the world. It was directed by none other than Kunihiko Yuyama who is also the chief director of the Pokemon Anime series. Interestingly the full version of the movie was aired on Japanese television on July 8th, 1999 before most places had even had it at the cinema. The movie featured slightly improved cgi and animation over the Anime episodes which had aired prior to it's release. Audiences across the globe could also take advantage of getting a free promotional Pokemon Trading Card when they went to a showing at theatres/cinemas. Pikachus Vacation - The first ever Pokemon pre-movie short film, it was 21 minutes long and unrelated to the main feature. Origin of Mewtwo - A ten minute prequel giving a background to the events that lead up to the event of the main feature. All things however are not created equal and this 10 minute Mewtwo's origin feature was only aired in Japanese showings of the movie. The only way international audiences could get their hands on this was on the bonus disc included with a special release version of the films direct sequel; Mewtwo Returns. Mewtwo Strikes Back - A prologue to the main feature showing the breakdown of the relationship between Giovanni and Mewtwo. Pokemon the First Movie - the main feature, a 75 minute feature film. The first movie was well timed, riding the crest of the wave of the global Pokémania phenomenon and smashing the box office and topping the charts in it's opening weekend and continuing to do so worldwide. The movie grossed approx 163.6 million USD by the end of it's showings. All of this in spite of many critics being pretty negative about it. Ash, Misty and Brock arrive at a Pokémon Paradise and leave Pikachu, Togepi and the rest of their Pokémon to spend some time in the park relaxing. The Pokémon venture into the giant park and start to explore, leaving their masters behind and going for some hard earned downtime and relaxation! When Togepi starts to cry because its hungry, we get to see Bulbasaur in action when it sings its "Bulba-bye" on screen for the first time in order to calm Togepi and put it to sleep, just then Ash Misty and Brock's Pokémon are approached by a group of other Pokémon belonging to other trainers; a Cubone, Marill, Snubbull and Raichu approach noisily and wake up Togepi, Pikachu rushes over to tell them to please be quiet, but they take offence to it and Bulbasaur and Squirtle run over to join in. Pikachu avoids further confrontation by telling the other group they shouldn't fight and should instead set a good example for the baby. The other group seem to be beginning to agree when Pikachu spots Togepi starting to wander off and heads off in pursuit, leaving all the other mons behind; leaving the other groups Snubbull and Squirtle having a rather strange face off which Snubble wins when Squirtle loses its balance and falls over, Bulbasaur then defeats the Snubbull in a staring contest and Pikachu gets back to find the group in a face off. Squirtle takes offence to the other groups Marill and the two challenge each other to a water race. An explosion from an Electrode signals th beginning of the race and the two water mons go head to head in a race, the Marill takes a clear lead before crashing into a Starmie who takes offence and water guns it back, Squirtle then meets a similar fate when it gets stuck to a Goldeen going the other way and despite a speedy effort to recover, Squirtle loses the race. The confrontation between the other group and Squirtle and Bulbasaur continues, Togepi starts to cry and while Pikachu comforts it, the other groups Raichu shocks them both, making Pikachu very angry. The two decide to settle the score with a race, a race which takes place while they are both electric-cheek to electric-cheek. Meanwhile Meowth, Arbok and Weezing have just settled down for a relaxing nap in the park when Pikachu and Raichu charge through them, before then running straight through a Hitmonlee and Hitmonchan and then unfortunately running over Charizard's tail. Charizard manages to catch the two up, get in front of them and blow them back the other way, it's then that both Pikachu and Raichu fall victim to being rolled on by Snorlax. Charizard flies back over to continue demonstrating it's power and while its looking to see a reaction from the Pokémon group it accidentally flies head first into a pipe, which it gets its head stuck in. Charizard's head is now badly trapped and it can't get out. Pikachu attaches a rope to Charizard's leg and the Pokémon belonging to Ash, Misty and Brock work together to try and pull him out, but to no avail. The other group meanwhile laugh at their failed efforts to free Charizard (who at this point starts to cry). Pikachu appeals to the other group to help them, and they agree, together the two groups (minus Cubone who still won't help) try to free Charizard. The Cubone watches on for a while before eventually being inspired by seeing the other Pokémon working together, it too joins in trying to free Charizard and after a colossal effort by everyone they manage to free him. Meowth has been trying to sleep on a ridge above and is rather disgruntled at the noise, just as he's about to throw a bomb down at all the Pokémon, Charizard lands on him flatenning him. All of Ash, Misty and Brock's Pokémon along with the new group they have now befriended then co-operate together to build slides, swings, seesaws, rafts and more to play on together. As the sun begins to set Ash, Misty and Brock's Pokémon bid farewell to their new friends, Pikachu and the Snubbull shake hands and then they all return to their trainers. The story of this ten minute prologue begins with a team of researchers heading to a remote part of the jungle to find a shrine to Mew which was created by an ancient tribe long ago. The tale is narrated by Dr. Fuji the head of the expedition who states that Giovanni of Team Rocket is funding his expedition. The key reason for the expedition is to find DNA of Mew, an ancient Pokemon who is known to be the most powerful of all, obtaining this is a shared goal for both Giovanni and Dr. Fuji however for completely contrasting reasons. Giovanni is funding the expedition so that if Dr. Fuji does manage to secure a sample of Mew's DNA he will be required to genetically engineer a version of Mew for Giovanni so that he can control the world for his own criminal ends. Dr. Fuji's goal however is a little different, he is hoping to learn how to create and restore life itself via Mew's DNA and the research that Giovanni is funding; with the ultimate goal of bringing his little girl Amber back to life. The expedition is a success, a small sample of Mew's DNA is obtained and taken back to the lab for testing and processing. Discussions amongst the scientists in the lab indicate that there have been a series of failed clones already which don't survive the process, and that they are yet to succesfully create one. Using Mew's DNA the Dr. Fuji and his team begin developing a clone of Mew, known as Mewtwo; also in the lab at the time is a cloned Squirtle, Bulbasaur and Charmander as well as the remaining life force of Dr. Fuji's daughter, Amber. Although none of these clones are awake they are able to commune via apparent telekensis (perhaps due to Mewtwo's precense) and the five spend some time together in the nether. At this point Mewtwo has no idea who he is, what he is or the reason for his being. We see a young, innocent Mewtwo learning from Ambertwo and enjoying his time with the Bulbasaur, Squirtle and Charmander clones, even visiting Amber's hometown where she used to live, a place which she refers to as "My memory place" as it was where she lived before she died. After enjoying watching their first sunset together the Charmander clone sadly dies, closely followed by Bulbasaur and Squirtle and finally Amber too starts to fade. As Mewtwo and Amber say goodbye this is when Mewtwo has his first experience of sorrow and pain. Before she fades away Amber tells a crying Mewtwo "My daddy used to tell me a bedtime story that when Pokemon are sad and they cry, that their tears are filled with life." a line which would hold greater importance in the movie to come. She tells him not to cry, because he is alive and life is wonderful. Meanwhile in the lab it's noted that three of the clones and Amber have not survived and that only Mewtwo remains, due to the things he has seen and experienced and the passing of his first friends Mewtwo's readings are going off the chart on the machines due to his growing upset and anger at what just happened. Dr. Fuji orders that they pump him with a serum in order to calm him down. The cloning process of Mewtwo continues for some time, showing him visibly growing in his stasis chamber as he contemplates "I have slept for so long..... it seems like forever...... but I remember something...... someone... life is wonderful.... but... why?" This segment of the movie begins with a fully grown Mewtwo opening its eyes in a stasis chamber in one of Giovanni’s labs. The scientists notice that Metwo’s brainwaves are going off the chart, and it smashes the glass chamber that it’s held in. The lead scientist Dr. Fuji then explains to Mewtwo that he was created from the DNA of Mew, Mewtwo is immediately concerned that he was created to simply be a shadow of Mew, however as Dr. Fuji explains Mewtwo is actually even more powerful thanks to human ingenuity. Mewtwo sits and contemplates it’s existence while the scientists all start celebrating and talking about beginning the testing on Mewtwo; this naturally angers him, as they clearly care nothing for him and think of him only as a test subject. Mewtwo gets extremely angry and begins destroying the lab with its psychic powers as the scientists flee in terror. After Mewtwo finishes destroying the lab it stands amongst the burning wreckage. Shortly after Giovanni arrives in a Team Rocket chopper and lands on the island with a proposition for Mewtwo; to become his partner and control the world together. Although Mewtwo initially rejects this proposal believing it could easily control the world on it’s own, Giovanni’s offer to help Mewtwo learn to control and focus its power wins him over and Mewtwo agrees. Giovanni and Mewtwo head back to the mainland where beneath the Viridian Gym Mewtwo is encased in special armor to act as a layer of defence as well as to help it focus its power. One by one Giovanni uses Mewtwo in battles at the Viridian Gym, as well as to capture a huge amount of wild Pokémon for Team Rocket. Back at Team Rocket Headquarters Mewtwo continues to contemplate, why? Why is he here? Understanding his power, but not understanding it’s purpose. Giovanni tells Mewtwo that it’s purpose is to serve humans and more specifically to serve him, this is a bit of a distance from the “partners” that Giovanni originally claimed them to be and stating that Mewtwo can never be his equal. Mewtwo takes great offence to this, feeling used and betrayed, destroys Team Rocket HQ and flees to the wreckage of the lab from which it came. Mewtwo vows to find his own purpose, and to purge the planet of all of those that oppose him; Pokémon and human alike! Ash, Brock and Misty are taking a short break from their Pokémon adventures and just as Brock is preparing a meal, a rather hungry Ash is sat down doing nothing… to hungry and weak to possibly work, that is until a trainer turns up and challenges him to a battle at which point he miraculously springs to life accepting the challenge. Ash’s Bulbasaur takes on the trainers Donphan and wins with a nice solar beam finisher, next the trainer sends out Machamp who is beaten by Squirtle. In anger and frustration, the rather rough looking trainer sends out all of his remaining Pokémon; a Golem, Venomoth and Pinsir who are all quickly dispatched by Pikachu’s thunder. As Ash celebrates his victory and the other trainer flees, Team Rocket are watching from the hillside. Ash and friends settle down for dinner when a Fearow equipped with a camera flies overhead. An unknown figure asks her master if an invitation should be extended to these trainers, whilst watching Ash, Misty and Brock on their screens. A Dragonite is dispatched with an official invitation for Ash and friends inviting them to join a select group of Pokémon trainers at an exclusive tournament on New Island, hosted by the worlds greatest Pokémon Master, the invitation goes on to advise that a ferry will be departing to New Island that afternoon. The group decide to accept the invitation and head to the ferry port. As the Dragonite is about to fly back to New Island, Team Rocket stop it in it’s tracks, wanting to know what was so special about the invitation that Ash got, and finding out. Meanwhile Mewtwo is brewing a terrible storm, making the seas around New Island treacherous for those that accept his invitation. Ash and friends arrive at the pier to find that all the ferries have been cancelled. There’s a lot of tension in the ferry terminal between the many trainers and their Pokémon who are all still waiting for ferries. Officer Jenny and the Harbour master explain to the group of angry Pokémon trainers that this is potentially the worst storm they’ve ever seen, they also advise against trying to get to New Island using Pokémon as they had to close the Pokémon Center due to Nurse Joy going missing. Many of the trainers defiantly set off on the backs of their powerful Pokémon such as Gyarados, Fearow, Dewgong. Ash and co resign themselves to being unable to get there since they don’t have Pokémon strong enough to withstand the storm, but just then some mysterious Viking-esque figures turn up in a longboat and offer them passage to New island. Ash and friends accept the invitation and the group set sail. The group have been sailing for a while when eventually they get hit by a giant wave, which near sinks the boat and dislodges Team Rocket’s disguises. Ash, Misty and Brock cling together and to Squirtle and Staryu as the vicious waves continue to throw them around. A while later the group surface to find the waters calm, they have reached New Island where they are greeted by the woman who sent them the invitation. Brock recognises the woman as the missing Nurse Joy, but she denies it. As Ash and co head inside the structure, a half drowned Team Rocket emerge just behind them. Unknown to everyone else Mew has just arrived at the island. 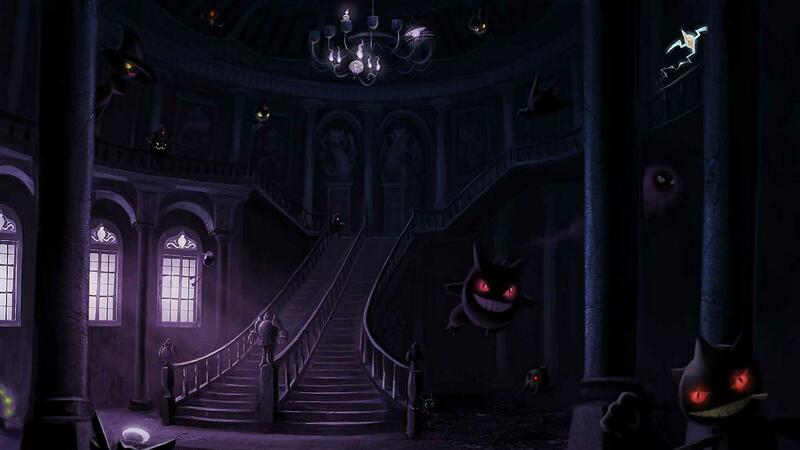 Ash and co enter the main hall of the structure to find the handful of other trainers who made it to the Island waiting. The master’s assistant declares that all trainers worthy of challenging her master are now present; 3 of them plus Ash and co. The doors close behind Ash and co, and they are instructed to let their Pokémon out of their Pokéballs. Team Rocket meanwhile are locked out and decide to try and get in via a sewerage pipe, Mew is outside toying with them and floating about playing. The other trainers introduce their Pokémon, each have an impressive array of powerful mons at their disposal, as the intro’s are finishing the greatest Pokémon Master on earth arrives, Mewtwo descends from high above. Team Rocket (unknowingly accompanied by Mew, who is still playing with them) continue to find a way in via the sewer entrance. Back in the main hall, the master’s assistant introduces Mewtwo as the most powerful Pokémon Master in the World as well as the worlds most powerful Pokémon. One of the trainers quickly objects and shouts that a Pokémon can’t be a Pokémon Master, Mewtwo responds by using its psychic powers against him, angry the trainer responds by sending its Gyarados to hit Mewtwo with a Hyper Beam. Mewtwo easily deflects the attack back at Gyarados rendering it beaten, and the extent of his powers are beginning to become apparent. At this point he releases his assistant from his command stating that he has no further use for her, it turns out it was Nurse Joy all along. Mewtwo introduces himself as the new master of this world and starts telling the trainers how it is. While beneath the ground Team Rocket discover massive amounts of stasis chambers containing Pokémon with strange markings. Jessie sits on a control panel and inadvertently activates the Pokémon replication system which proceeds to grab Meowth and begins the procedure to clone him. A video begins to play on the monitor, its by Dr. Fuji at the time while his lab was being destroyed during the Mewtwo Strikes back prologue, Team Rocket (and Mew) watch it and wonder who rebuilt the lab that was once destroyed. Mewtwo states that not only does he seek to destroy all humans, but also all of the Pokémon that serve them. One of the trainers sends a Rhyhorn to attack, and Mewtwo makes easy work of throwing it across the room. Ash challenges Mewtwo to a real match (really, Ash?) and Mewtwo uses its psychic powers to begin making clones emerge from the chambers below. A huge Blastoise, Charizard and Venusaur emerge and head to the main hall. A huge stadium is then revealed. One of the trainers has a Blastoise called Shellshocker, the other a Venusaur called Bruteroot and Ash of course has his Charizard, the trainers don’t believe “copies” could beat the real Pokémon and challenge Mewtwo. In the Stadium Mewtwo and his clone Venusaur takes on the trainers Bruteroot, the clone quickly overpowers the normal Pokémon and next up is the other trainers Blastoise which again is quickly defeated. Despite seeing how powerful the clones are, a defiant Ash sends Charizard to face it’s clone, and after a short battle it too is defeated. Mewtwo declares that as the victor he will now claim his prize; the trainers Pokémon. He sends a special type of ball which immediately captures Ash’s Charizard, and the Venusaur and Blastoise belonging to the other trainers. Misty demands to know what he’s going to do with the Pokémon and Mewtwo answers that he will use their DNA to produce clones for himself, which will remain safe with him on this island while his storm destroys the world. Mewtwo unleashes a huge amount of he’s dark Pokéballs which begin pursuing and catching everyones Pokemon despite the trainers best attempts to save them. Pikachu is the last one left and runs up the high spiral staircase in the centre of the room, shocking the balls as he runs, eventually though he gets tired and he too is captured. Ash sees where all the Pokemon go and gives chase. Just as the ball containing Pikachu is sucked into the cloning machine Ash goes down the conveyor and grabs it, prompting the machine to eventually explode, and managing to free Pikachu. Team Rocket who have been in the basement this whole time watch all the new copies of all the trainers Pokémon hatch and head back to the main arena and hall. When the cloning machine finishes exploding it releases all of the Dark balls and the real Pokémon all break out. Mewtwo confronts the remaining trainers, and opens the door for them stating that he will spare their lives for now. Just then the cloned versions of all the Pokémon arrive at the stadium, and shortly after leads the entire group of real Pokémon back up to the stadium too and vows now to let Mewtwo do it. Ash runs at Mewtwo and tries to punch it (Ash, wtf). Ash then gets thrown through the air and is about to hit the stone pillar behind him when something cushions his fall, a bubble placed by Mew. Mew comes to confront Mewtwo, Mewtwo declares that the world is too small for the two of them. Mewtwo pursues Mew (who still seems to be playing) and eventually hits him with a Shadow Ball, Mew then fires back with a powerful attack of it’s own, smashing Mewtwo to the ground. The two begin a confrontation and Mewtwo continues to attack Mew. Mewtwo uses his psychic powers to block all the other Pokémon’s special abilities and all the Pokémon are pitted against their respective clones in gruelling physical combat. Mew see’s that Mewtwo cannot be reasoned with and has no choice but to engage him in battle, and the two continue to fight in the air above the main stadium. Many of the Pokémon are becoming exhausted and beginning to collapse. Team Rocket are even sad to see how horrible the fighting is. And then Meowth is approached by it’s own clone, but the two don’t fight, and agree that they have a lot in common and there is no need to fight. The battle between Mew and Mewtwo meanwhile rages on. Ash climbs his way back to the stadium where he see’s the clone Pikachu attacking his own, Ash’s Pikachu refuses to fight back. Ash finally gets back to the arena floor and he, Brock, Misty and Nurse Joy watch as more exhausted Pokémon and clones collapse on the floor, and Mewtwo and Mew continue their fight. Ash decides that someone has to make a stand and try to stop the fighting. Mew and Mewtwo return to the stadium floor, locked in battle and just as the two get ready to unleash their most powerful attacks Ash see’s the terrible state of all the injured Pokémon and clones and runs between Mewtwo and Mew to try and stop them fighting; both attacks hit Ash who falls to the ground motionless. Pikachu approaches him and begins poking him and shocking him but Ash remains on the ground. All of the Pokémon stop fighting, Pikachu begins to cry… closely followed by all of the other Pokémon and clones. The tears of the Pokémon flood the stadium, as the other trainers, Mew, Metwo and all of the Pokémon watch on. A light shines into the stadium, the storm clears and colour returns to Ash who seemingly comes back to life on the stadium floor and reunites with Pikachu. The real Pokémon and the clones that had been fighting celebrate that Ash isn’t actually dead. Mewtwo realises that Ash sacrificed himself to save the Pokémon, his anger seems to be subdued… Mewtwo realises that the circumstances of your birth do not dictate who you are, but the things you choose to do. The clone Pokémon begin to fly off into the sky alongside both Mew and Mewtwo. Ash shouts to Mewtwo to ask where he’s going; Mewtwo replies that he’s going to go where he’s heart can learn what Ash’s already knows. Before he finally departs Mewtwo wipes the memory of everyone present. The events at the Ferry terminal are repeated, but this time when Jenny and the Harbour master tell everyone that the storm is too terrible for any ferries to leave, Nurse Joy appears stating that anyone who needs a place to stay can board at the Pokémon Center. Ash Misty and Brock are at the terminal but are none the wiser as to why they even came. Outside the storm miraculously disappears and the skies begin to clear. Ash spots something go into the clouds and recalls the time he saw a really rare Pokémon the day he left Pallet Town, and that he’s sure he just saw another one. Team Rocket meanwhile are still at New Island, which has had all traces of Mewtwo’s stadium etc erased from it and is natural and untouched with the sun shining on it. Ash, Misty and Brock continue on their journey. Pikachu Ash Accompanied Ash to New Island. Refused to fight back against it's cloned version. Meowth N/A Meowth sneaked onto New Island with Jessie & James, plotting to steal rare, valuable and powerful Pokémon. Befriended his cloned version. Togepi Misty Accompanied Misty to New Island. Charizard Ash Accompanied Ash to New Island. Fought against it's cloned version in standard battle and later on in physical combat. Squirtle Ash Accompanied Ash to New Island. Helped Ash & Group survive when their boat capsized in the storm. Staryu Misty Accompanied Misty to New Island. Helped Misty & Group survive when their boat capsized in the storm. Psyduck Misty Accompanied Misty to New Island. Arcanine Gary Gary's Arcanine was defeated at the same time as his Nidoking in the battle mentioned above. Donphan Raymond This Donphan battled Ash's Bulbasaur at the start of the movie and lost. Machamp Raymond This Machamp battled Ash's Squirtle at the start of the movie and lost. Golem Raymond One of three Pokémon sent out at the same time in frustration that his previous two Pokémon had lost. Defeated by Pikachu. Venomoth Raymond One of three Pokémon sent out at the same time in frustration that his previous two Pokémon had lost. Defeated by Pikachu. Pinsir Raymond One of three Pokémon sent out at the same time in frustration that his previous two Pokémon had lost. Defeated by Pikachu. Gyarados Fergus Fergus used the awesome strength and power of his Gyarados as a means of travel to New Island when all of the Ferry's were cancelled. Pidgeot Corey When the Ferry's were cancelled due to the storm, Corey flew to New Island on the back of his Pidgeot. Venusaur Corey Corey's Venusaur named Bruteroot. Accompanied Corey to New Island to challenge Mewtwo. Fought against its cloned version in standard battle and physical battle. Rhyhorn Corey Accompanied Corey to New Island to challenge Mewtwo. Attempted to hit Mewtwo with a takedown but was easily defeated. Later fought it's own clone in physical combat. Dewgong Neesha When the Ferry's were cancelled Neesha travelled to New Island on the back of her Dewgong. The same Dewgong later had to fight its own cloned version in physical combat. Wigglytuff Neesha Accompanied Neesha to New Island to challenge Mewtwo. Blastoise Neesha Neesha's Blastoise named Shellshocker. Accompanied Neesha to New Island to challenge Mewtwo. Fought against its cloned version in standard battle and physical combat. Vileplume Neesha Accompanied Neesha to New Island to challenge Mewtwo. Ninetales Neesha Accompanied Neesha to New Island to challenge Mewtwo. Rapidash Neesha Accompanied Neesha to New Island to challenge Mewtwo. Bulbasaur Dr. Fuji One of the test subjects and attempts to clone a Pokémon in the Origin of Mewtwo Prologue. Bulbasaurtwo as it was named in tests didn't survive the cloning process. Charmander Dr. Fuji One of the test subjects and attempts to clone a Pokémon in the Origin of Mewtwo Prologue. Charmandertwo as it was named in tests didn't survive the cloning process. Squirtle Dr. Fuji One of the test subjects and attempts to clone a Pokémon in the Origin of Mewtwo Prologue. Squirtletwo as it was named in tests didn't survive the cloning process. Tauros Rocket Grunts When Giovanni and Mewtwo came to an agreement to work together Mewtwo used it's powers to restrain a herd of Tauros, which were all subsequently captured by Team Rocket grunts. Onix Unnamed Trainer This Onix was defeated when an unnamed trainer challenged the Viridian Gym and was defeated by Mewtwo. Alakazam Unnamed Trainer This Alakazam was overwhelmed by Mewtwo's psychic powers when it and it's trainer challenged the Viridian Gym. Magneton Unnamed Trainer This Magneton had its own attacks turned against it by Mewtwo when it and it's trainer challenged the Viridian Gym. Mewtwo Himself Mewtwo, the main antagonist of the movie's main feature. We see in the prologue Origin of Mewtwo why he was so angry with humans, we see even more justification of his anger and the way he was ill-treated in Mewtwo Strikes back prologue. He is out for revenge against both humans and the Pokémon who serve them throughout the movie. Dragonite Mewtwo This Dragonite is effectively Mewtwo's courier Dragon, and delivers invitations to trainers deemed worthy of an audience with Mewtwo. Mew Himself Mew was playing in the ocean when it sensed something was wrong and was drawn to New Island, Mew travelled there to confront an extremely angry Mewtwo and to try to reason with him, but initially to no avail. The voice cast, including characters from both Prologue's; Origin of Mewtwo and Mewtwo Strikes Back. In addition to the cards above there was also another card featuring Mewtwo, if anyone has the scan for that one it would be awesome if you could send it in. Western & Japanese movie posters, DVD release covers from various regions and other promotional material used to advertise Pokemon the First Movie. When the Ferry's are cancelled and Neesha, Fergus and Corey head out to New island on their Dewgong, Gyarados and Pidgeot respectively a fourth trainer is briefly shown; a female trainer on the back of a Fearow - she never made it to New Island. Some people believe that her and her Fearow succumbed to the storm where others actually think it was a continuity error and was meant to have been Corey and his Pidgeot, this is doubtful however as getting both the trainer and Pokemon wrong would be a bit of a gross error. Even when Mewtwo wipes all the trainers memories and returns them to the Ferry terminal, this trainer is never seen again. This movies Pikachu short; Pikachu's Vacation features the debut appearances of Snubbull and Marill, both of which are Gen II Pokemon. The main movie also features the debut appearance of Donphan, another from Gen II. It has been mentioned in the anime on numerous occasions that if the flame on a Charmander, Charmeleon or Charizards tail goes out, it will die. In spite of this both the cloned Charmandertwo and Charizardtwo that Mewtwo creates were grown in stasis chambers full of water, and no flame is visible on either, but despite it they lived (for a while at least, in the case of Charmandertwo). Pikachu is caught in a Pokéball during the main feature, this is the only time we see Pikachu going into a ball at any point during the anime for many years. The only other occurence was in Pokémon - I Choose You! There were a number of attacks demonstrated in the movie which were not available in the games at this point. For example Raymond the Pirate Trainer's Donphan used Rollout, Mewtwo attacked Mew with a Shadow Ball and Blastoisetwo knew Rapid Spin. A number of Pokémon on both the Japanese and Western movie posters didn't actually make an appearance in the movie, or it's prologues or Pikachu short. This is the only Pokémon Movie where Ash isn't featured on the DVD cover. The only Pokémon present on New Island which didn't get captured by Mewtwo and used as a basis for the creation of clones were; James' Weezing which was never released from it's Pokéball and was kept under wraps, Misty's Togepi which she hid in her backpack and also Misty's Staryu which had been resting in it's Pokéball during the gathering after helping rescue Ash and crew from the rough seas. When this movie was released on home video it included a trailer for Pokemon the Movie 2000: The Power of One and also included a free trading card. Additionally this movie was also released in LaserDisc format and featured the Pikachu's Vacation short movie. The american release of the home video featured a short introductory video by Professor Oak which was put together with footage from Professor Oak's Alakazam lecture from Episode 66 of the Anime. In regards to the 'death' of Ash Ketchum in the movie and the tears of the Pokémon bringing him back to life, notes by Takeshi Shudo contradict this theory... he states that the blast that hit Ash caused him to become petrified (not die) and that the tears of the Pokémon simply restored him from that petrified state (as opposed to bringing him back to life). Continuity errors and bloopers from the movie and it's prologues. At the start of the movie when Ash is battling Pirate Trainer Raymond, he uses Pikachu to defeat three of Raymond's Pokémon at once with a Thunderbolt.... one of them was a Golem, a Pokémon whose type dictates that the attack should have had little to no effect. When Mewtwo is using it's psychic powers to generate a storm around New Island, there's a scene where it's pink. In the scene that follows it's normal colour is restored. Just before Fergus jumps on board his Gyarados at the Ferry Terminal, it's lips are blue instead of yellow for a couple of frames. In the western release of the movie a few Pokémon were referred to be incorrect names for example Pidgeot got referred to as Pidgeotto by Corey (easy mistake), Scyther was referred to as Alakazam (wtf) and Sanslash was referred to as Sandshrew. Fergus proudly proclaims all of his Pokémon to be water types, and thats why it was so easy for him to reach new Island. He then introduces his Nidoqueen, a Poison/Ground type. As Ash takes a moment to admire Fergus' group of Pokémon, there is a brief moment where you can hear Ash's Japanese voice faintly over the sound of the Pokémon. In the DVD release of the movie the selection screen refers to Togepi as Pokémon #152, but that's actually Chikorita. This same error had been made a few times in other publications prior to this also.At the start of the movie when Ash is battling Pirate Trainer Raymond, he uses Pikachu to defeat three of Raymond's Pokémon at once with a Thunderbolt.... one of them was a Golem, a Pokémon whose type dictates that the attack should have had little to no effect. In the DVD release of the movie the selection screen refers to Togepi as Pokémon #152, but that's actually Chikorita. This same error had been made a few times in other publications prior to this also. Despite mixed reviews from critics, who really cares what they thought given that the first movie had fantastic box office takings and actual Pokémon fans recieved the movie really well. This movie was succesful enough that it wasn't long before Pokémon the Movie 2000: The Power of One was put into production.